Can I just add that if you're going to message someone about buying something, please hold up your end of the deal? 2 different people have messaged me about the hoodie and both have ended up not buying it and just completely ignoring my messages and not even telling me they can't get it. Seconded from a purchasing point of view. I messaged, emailed and messaged again once for something and the first I heard back was when they posted it on here that they had sold it. You can take the Kobra Kid&Fun Ghoul... shirt down, I found that I can actually buy it from a store in the UK. And I'm selling a brand new unworn Revenge Hoodie! It's only been lying in my closet eversince I bought it. It's a size large / unisex. Please make an offer in case you're interested, I'm going to upload some pics of it later. anyone want to trade with me?? What were you looking to trade? Is the "wanted" shirt the black or white version? What size are the shirts? Can you give us any more info? 1. Looking for Bad luck beads to trade for "Wanted" shirt or "I don't need your friends I've got my own" shirt. i found this on ebay... it has the patch in it! But that's just a picture from Google, I'll upload one later when I'm back home. Yay! Thank you so much! That's very helpful for my collection. I hope you're not getting rid of your REVENGE hoodie. Was this an extra one? I would like to add a listing for any old MCR merch in women's size small/medium/large or unisex small/ medium. Hey! 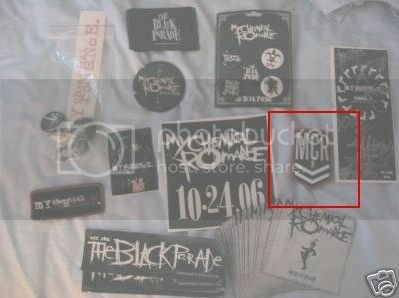 I've been thinking of covering my room with MCR posters and stuff... I don't really have anything to trade but does anyone have any extra posters they're not using? I've been looking for a particular hoodie for years, now. I don't know what it's called so I'm just attaching a picture I found on google. Can anyone help me out? I own the very one, although I can't wear it much any more because there are holes in it...All the love. The website I bought it from in 2009, is called Top Goth: http://topgoth.co.uk/... According to my email records, it's called 'Together Zip Hoodie'. Wait, it was called Top Goth. Now it's something else. Either way, I can't find the hoodie! It seemed pretty rare back when I got it, so perhaps try eBay? I've tried but have never had any luck. Edit: Oh my God! Thank you for posting the name. Because of that I've managed to find three different online stores that stock it. Double Edit: Scratch that. They're all out of stock. please take the Revenge Hoodie off my 'selling' List, it's sold. My 'looking for' list is still up to date. I wish I could find a japanese Mikey Shirt so bad! Hey can you take down the party poison jacket, box, and CD? I was able to sell them. Thanks! Finally updated all of this after a month of no internet followed by almost a month of forgetting. I'll try and keep on top of this now. Ooh, could you please put me down for a small/medium NLBBL top? Fans' shipping has to be more reliable than the store's.